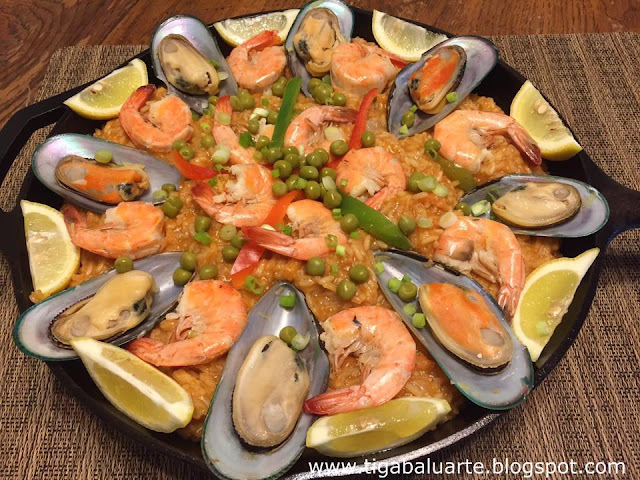 The Filipino Style Seafood Paella recipe is a popular rice dish in the Philippines specially during special occasion. It may look like a complicated dish to cook but maybe only at first. Just organize all the ingredients needed and you will be just fine. 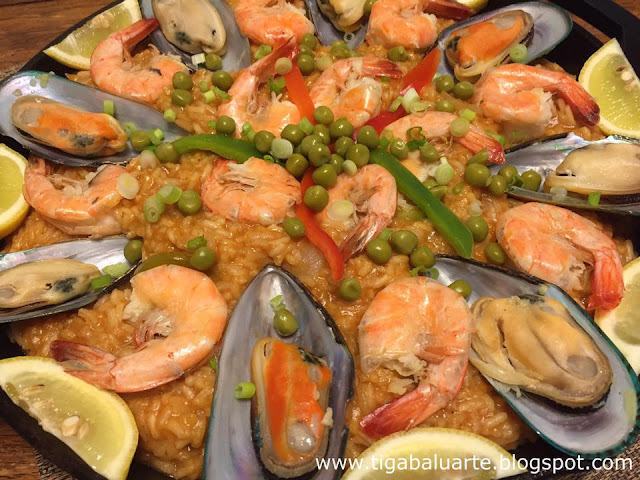 When cooking Seafood Paella you can add clams, mussels, shrimps, squid, crabs and fish. You can also cook Paella with chicken and some even add pork. This recipe I have is a simpler version. It only have shrimps and mussels as no time to do another run in the market. All really depending on your preferences. Heat a wide pan in medium. Add 2 tbs. olive oil and sauté rice for about 5 minutes. Remove rice from the pan and set aside. Using the same pan, heat and add remaining olive oil. Saute garlic, onion, ginger and tomato until translucent. Add chicken bouillon and stir to mix. Cook for a minute. Add mussels and shrimps. Stir gently and cook for 2 minutes then add water, fish sauce, salt and ground pepper. Allow to boil to cook the mussels and shrimp for about 5 minutes. Remove mussels and shrimp and set aside. Continue to simmer broth in low heat. Add sautéed rice to the simmering broth and reduce heat to low. Add paprika and tomato sauce to the rice. Stir, cover and cook until rice is tender. Add more chicken stock if needed. Stir every few minutes to avoid the rice from sticking to the bottom of the pan. Stir in green peas (save a teaspoon for later), green and red bell peppers and cover. Cook for another 3-5 minutes while stirring every few minutes to avoid the rice from sticking to the bottom of the pan. Make sure to reduce heat to the lowest possible and allow the steam coming from the covered pan to cook the rice. Put half of the seafood back to the pan and stir well. 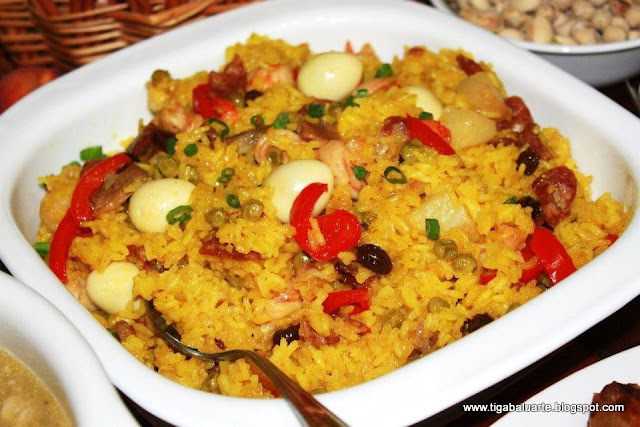 Transfer cooked Paella into a serving platter and garnish with the remaining seafood, lemon wedges and chopped green onions. 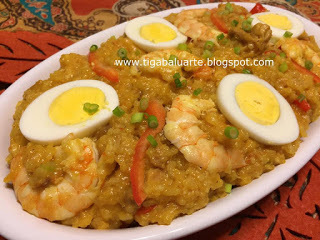 You can if you dont have Malagkit rice but the outcome wont be the same.